Adventure gaming journo. Fantasy/SF writer. Adventure Ed - Crash/Zzap!64 Annuals. White Wizard 2.0. Eight Bit Adventurer. Tolkienista. #ElderGeek living on the edge of Mordor. I write for the users. Amiga User International’s new web editor and publisher Stuart Williams will be visiting the school where William Shakespeare was educated this Saturday – to attend a computer science fair! RECURSION 2018, which takes place on 17 February at King Edward VI School in Stratford-upon-Avon, England, will be the first event reported upon in AUI’s name for more than twenty years. Stuart will be attending the popular show, which mixes equal parts of computer education, retro computing and maker activities such as robotics, firstly to cover the traditionally strong Amiga presence and secondly to look at the fair in general, which includes retro computing/gaming from the Retro Computer Museum, Risc OS related exhibitors, Raspberry Pi, educational exhibitors and activities from schools, as well as maker exhibits including robotics. Such events are uncommon in post-home-computer UK, and are well worth supporting. The event itself, which offers computing fun and education for all ages, is open to the general public in the school’s large, modern Levi Fox Hall, between 11am – 3pm, and admission is free. The address is: King Edward VI School, Church Street, Stratford-upon-Avon, Warwickshire, CV37 6HB. If you attend the fair, do watch out for Stuart, who will be wearing an Amiga User International t-shirt and carrying a camera – and say hi! An AUI report with photos will be published on this website early next week. In the meantime, for details of RECURSION 2018, including parking etc, click on this link. For pictures of last year’s Amiga section of RECURSION, check out this page. A commentary on AmiExpo in Los Angeles, USA. The AmiExpo hit the West Coast of the U.S.A with an impact equalling its highly successful debut in New York, bringing some new and very exciting products. It also provided a focus that unquestionably strengthened and should encourage the whole Amiga community. With now over seven hundred software and hardware products available to Amiga users, the machine is clearly carving out a place for itself in the computer world that many believed would never happen. The Amiga now offers an enormously wide range of possibilities from budget games to the highest technical applications — a range that probably no other comparable computer has ever achieved and which is allowing the fulfilment of its tremendous potential. We hear that the Mount Palomar telescope is now using an Amiga in its astronomical work and among the fast increasing and extra-ordinarily broad spectrum of subscribers to this magazine, we have just received a subscription request from one of the top scientific governmental departments in the U.K. Yes, the AmiExpo reinforced the sense that the Amiga dimension has grown to a full international scale. And there is a growing feeling that Europe is beginning to challenge the American leadership, as U.S. companies are becoming aware of the opportunities that Europe, and the rest of the world, presents and as Amiga products of European origin start to make an impact in the U.S.
We saw some interesting examples of transatlantic collaboration. The U.S. company, Aegis, used the show to launch a German-written game. Abacus, another American company, was showing Germany’s Databecker products which it has published in English — and shipped over to the U.K. And in the U.K. itself a games house, Grand Slam, bought the rights to the U.S. written novel ‘The Hunt for Red October’, created the computer game and is now successfully exporting the game back to the U.S.A. 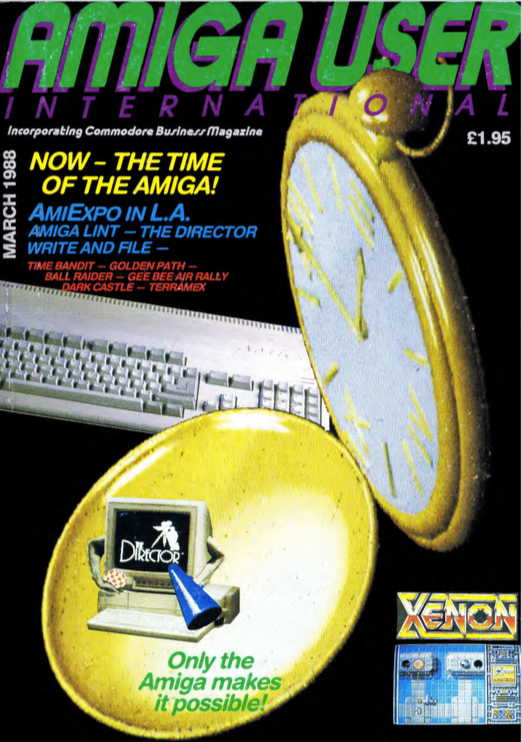 It is also encouraging to find that the readership of Commodore Amiga User International Magazine already stretches from the U.K. to Brazil, from Finland to New Zealand, yet more support for the view that – with approaching 500,000 Amiga users worldwide, the Amiga is already one of the few computers to have created for itself a global dimension. The Commodore Amiga is a now-legendary series of home and business computers that had its origins in the fertile minds of some very inventive and creative people who got mixed up in the computer wars between American companies Atari and Commodore back in the early 1980s. The first of the line Amiga A1000 was years ahead of its time and was an important milestone and pointer to the future of computing. The Amiga remains one of the most popular hobbyist and creative computer systems ever, and is still beloved of thousands of retro-computing enthusiasts and hobbyists, occupying a proud place in the history of computing. We enjoy its legacy today in many ways. July 2015 saw the thirtieth birthday of the Amiga A1000 computer itself, and that was loudly celebrated around the globe, but before that, a very special group of Amiga fans, organised through a Facebook group, decided to dedicate an annual day, International Amiga Day, to remembering and using their Amiga computers in memory and celebration of the late Jay Miner, the remarkable engineer who is generally honoured with the title ‘father of the Amiga’. The editor and publisher of this site, Stuart Williams, is proud to have been a regular contributor to the first ever European magazine dedicated to the Amiga, the now-defunct Amiga User International magazine (affectionately known as AUI), and we are therefore delighted to be able to re-publish in this new Amiga User International website this interview from the pages of AUI, both in tribute to Jay Miner and to the much-missed Amiga User International, in this thirty-third year of the Amiga. Sadly, there is no indication in the June 1988 issue of Amiga User International, where this interview was first published, as to who conducted the interview. Possibly it was the Managing Editor and Publisher Antony Jacobson, but credit was not given, and we would be glad to hear who it was if anyone out there knows. Nonetheless, it stands today as one of the most interesting and insightful slices of computing history from the twentieth century. ‘The father of the Amiga’ – the man most credited with its initial development – gives AUI an exclusive interview in which he tells how the computer came into being, says some very tough things about how it nearly never happened, and predicts what may come next. I completed six months of Electronics Technician School in the [US] Coast Guard, and then I spent three years on Coast Guard in the North Atlantic Weather Patrol repairing radars, radios and also the Captain ‘s Hi-fi. That’s how my interest in electronics got started. After the service I studied engineering. I graduated in 1958, with a major in the Design of Generators and Servo Motors. The first thing, however, that I was asked to do after graduation was to design a Computer Control Console with a Video Display, I had to teach myself transistor circuit design and logic design out of the few books which were then available. This was an advantage however since it was easy in those days to learn enough out of one book to become the company expert. In 1964, I went to work for General Micro Electronics, the first spin off in Fairchild devoted exclusively to MOS chips. Again it was easy to become an expert in this field, because the field was so new. We designed sixty-four of their chip register chips and the world’s first MOS Calculator with twenty-three custom chips. In 1974 after ten years of calculator, watch and computer chip design at a lot of different chip companies, Atari was just starting up and needed a chip designer. My friend Harold Lee was already there and he introduced me to Nolan Bushnell (the founder of Atari). Harold had done the chip for the first video game and Nolan Bushnell asked me to do a chip for the video game twenty six hundred system. You probably know how successful the twenty six hundred or the Video Computer system as it became called, was, so in 1977 they asked me to design the new Atari computer the 400 – 800 model. I directed the architecture and the chip designing of this new machine and this too was a huge success. The year was 1979 and Atari was rolling in money. However, they made a decision to write off all of the development costs in that first year production. This allowed them to show just enough profit that year to not quite trigger the bonus payment they promised to the engineers and programmers. The chief programmer on the project’s name was Larry Kaplan and a half a dozen of his team went off to start Activision. This was the beginning of the end for the old Atari however, I wanted to do an advanced sixty-eight thousand machine at that time to compete with Apple but Atari decided that they did not need another computer. They decided not to pay the bonus they promised me and the engineers. So I quit, as did nearly all of the engineers and programmers. Atari then started to produce a bunch of junk cartridges, thinking that the public would buy anything I guess, I blame them in large part for the crash in the video game business that happened a few years later. I spent the next three years in a chip company called Zimast doing special purpose computer chips for heart pacemakers. It was in 1982 that the programmer I mentioned earlier, Larry Kaplan, called me up and said he was unhappy with Activision and did I know anybody with money who could help him start a company. Most people don’t know but it was actually Larry Kaplan who started AMIGA although it was not called AMIGA then. Welcome to the regenerated Amiga User International, an online magazine and tribute website dedicated to the original, first ever European magazine which focused on the Commodore Amiga home computer. Amiga User International (fondly known to many simply as AUI) was first published as a supplement in Commodore Computing International from 1986. In January 1988, it was re-launched as a full independent newsstand magazine, published by Croftward Ltd. The launch of this website in January 2018 marks the 30th anniversary of that independence. This Amiga User International site is published and edited in tribute to that much-missed magazine, its staff and its contributors, by myself, AUI’s former freelance communications guru, PD software specialist and occasional reviewer. At the moment I am something of a one-man band. I would welcome the help of past staff and fellow contributors, or indeed new contributors, if any would like to come forward. The original Managing Editor and Publisher of AUI, Mr Antony H. Jacobson (previously of Croftward Ltd), has kindly granted me permission for the republication of all original content from the printed AUI, plus Commodore Computing International, on this site. My aim is to select and reproduce interesting and relevant content from past issues, to look at the history of AUI and its people, and to publish new posts and content reporting on Amiga news and the present-day Amiga community and scene in general, plus reviews of books, magazines, hardware, software and websites, as time permits. The Amiga User International website is presently under construction, and it will take time to evolve and to build up extensive content both old and new – so please keep coming back. You have now entered the Amiga dimension. Remember – only Amiga makes it possible! This is a test post to demonstrate the manual featured post slider. Watch this space for more to come!